Three years ago when the UCI began to allow disc brakes for cyclocross racing, it opened a floodgate — a number of manufacturers rushed to adapt discs for road/cross disciplines. Quick advances in brake assemblies, frame fittings and forks, hubs and all the other attendant bits occured. Still, many people wondered if brakes were really needed for road bikes…and if mechanical (cable-actuated) brakes were up to the task. A couple boutique manufacturers developed mechanical-to-hydraulic adapters, such as the TRP Parabox, among others. And that set the big manufacturers to putting their R&D muscle behind the idea of hydraulics for the road…but how to fit a master cylinder into the shifter body? It took a couple of years before it was ready, but things are finally starting to make it to market. SRAM came through first with the “Hydro R” setup in two versions: RED for the well-heeled, and the S-700 for a somewhat more affordable option. The master cylinders are contained in the brake/shift lever bodies, and here’s the really interesting thing: they come in disc OR hydraulic rim brake options. 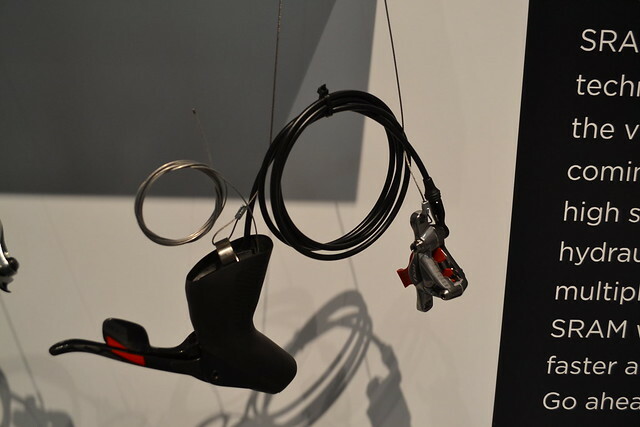 Forgive these somewhat awkward photos, but SRAM’s display made it difficult to get a good shot of the brake options. Check SRAM’s website for all the lurid details and better product images. Over at Shimano, things are not quite ready for release. 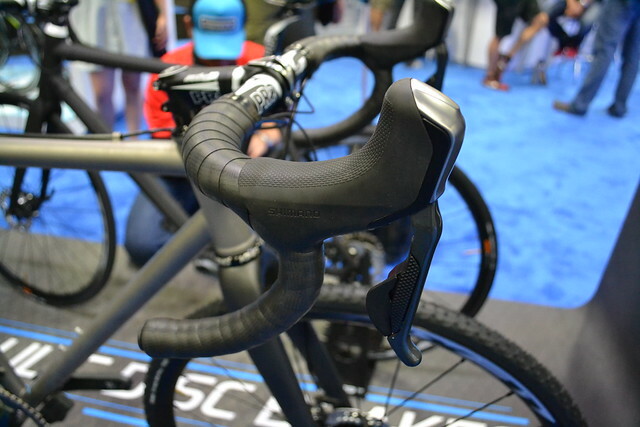 They had prototype Dura Ace Di2 hydraulic brakes/shift levers on display, and they felt good in the hand. They’re not scheduled for release until spring 2014, according to one of the Shimano techs I spoke to. 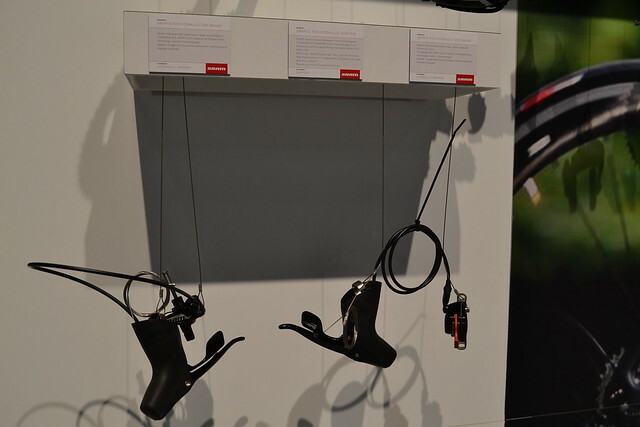 Visit Shimano’s site for more details on the brake systems they will offer for the road. The brake bodies and discs borrow technology from Shimano’s mountain groups, namely the ICE heat management system. Road discs can get extremely hot during prolonged descents, and that is the Achilles Heel of hydros, according to a number of sources. Shimano’s ICE system should help alleviate heat-induced brake fade. I asked the Shimano tech if this hydraulic wizardry would trickle down to more affordable options for “regular folks” who can’t afford Dura Ace/Ultegra. 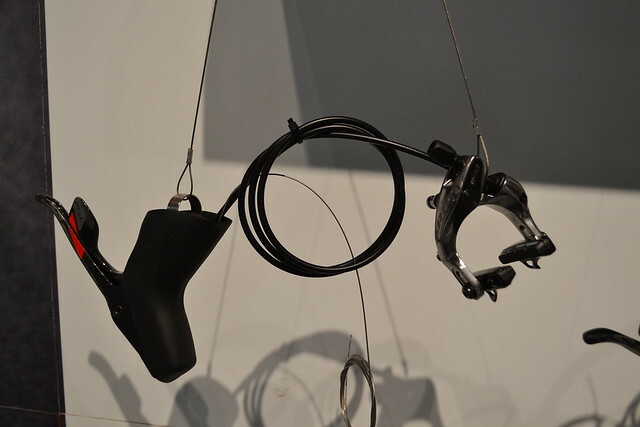 Alas, Shimano plans only to offer hydraulic discs on their two upper-end Di2 groupsets…not even mechanical Dura Ace will be graced with a master cylinder setup. The reason for this is that they wanted to maintain the existing Di2 lever shape without a “unicorn bulge”, according to the tech I spoke to. SRAM’s shifting assembly and the master cylinder together take up a lot more room and necessitated a lever redesign on their end. Finally, for those of you who use other components, or dig your current brake/shifter setup, there’s hope for you. TRP has unveiled their HY-RD system, which is cable-actuated and has the master cylinder mounted to the brake body itself. 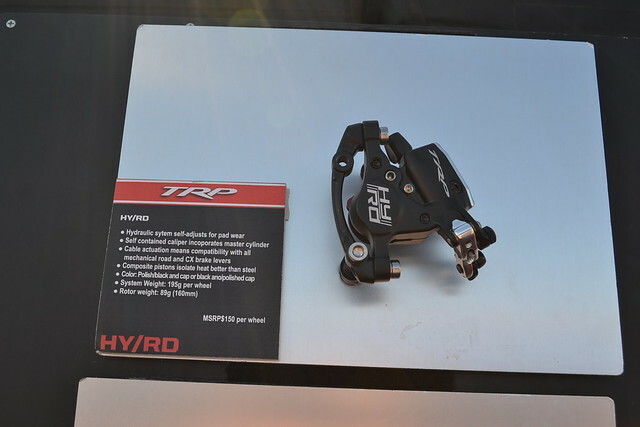 TRP claims this HY-RD system will work with any current mechanical shifting system. TRP also still offers their Parabox adapter system. 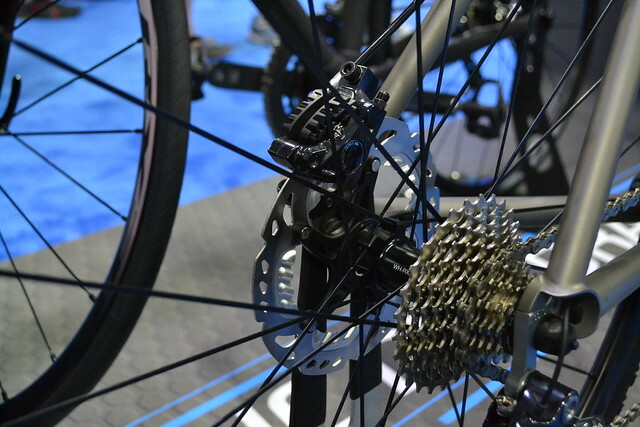 We’re curious — are road disc brakes in your future? Any thoughts on mechanical vs. hydraulic? We’d love to hear your thoughts/gripes/concerns/WTFs. The technology still has a bit of refinement to go, but it is great to see the big component makers getting behind this new application for hydraulics.